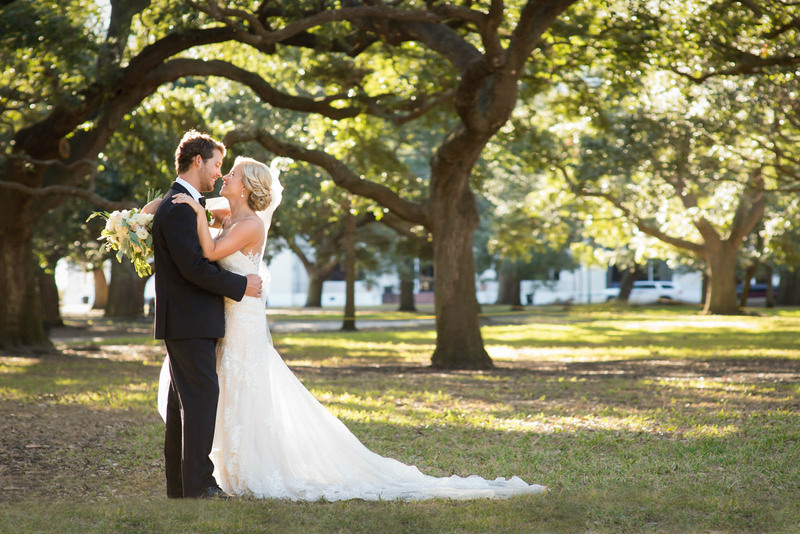 Ansley and Chip are a wedding photographer's dream. A great looking couple, very much in love, and comfortable in front of the camera. It is a joy when clients can relax and be themselves and forget about their photographer. In this image is a stunning bride in her flawless dress by Esence of Australia embraces her groom under a canopy of back lit oak trees. Her ivory rose bouquet (courtesy of florist Greg Foster) is perched upon his shoulders, and he grabs her around her waist. The newlyweds noses are just an inch apart and they gaze lovingly into each other's eyes. The sun positioned behind them is illuminating the bride's veil and creating a rim of light setting the couple apart from the oak tree background. This image was taken at the battery in downtown Charleston, SC. The bride and groom were married at Stella Maris Catholic Church on Sullivans Island and held their reception in the Cedar Room at the Cigar Factory in downtown Charleston. The bride's stunning dress is by Essence of Australia, and a special thanks to coordinator Haley Kelly from a Charleston bride for pulling off this flawless day!